Met Éireann warned commuters and shoppers to expect raw, bitterly cold conditions for the next 48 hours as it emerged parts of Ireland experienced the wettest March for 11 years. Ireland basked in temperatures warmer than Barcelona - but people have been urged to get out and enjoy it while they can. A mammoth clean-up begins this morning after Storm Gareth battered parts of the country and left thousands of homes without power. HEAVY snowfall during Storm Freya caused "extremely poor" driving conditions, with some road impassable and motorists facing traffic chaos. Wet and wintery weather continues today with heavy rain and winds expected to turn to snow in some parts of the country. The country is set for another wet and windy weekend as two yellow warnings were issued this morning. A yellow weather warning has been issued for three counties as Ireland braces for winds of up to 100kmph over the weekend. Storm Erik was winter’s swan song as the spring is set to announce itself with temperatures of up to 15C next week, according to Met Éireann. Storm Erik is set to batter Ireland with "severe" gusts of up to 130kmh and Met Eireann has extended a Status Orange weather warning. Met Éireann has issued Status Orange and Yellow weather warnings for Ireland as Storm Erik is set to bring gale force winds. Met Eireann has issued a status yellow weather warning as strong winds are set to hit Ireland on Friday. Winter coats, hats and scarves at the ready, we're in for a chilly end to the month. 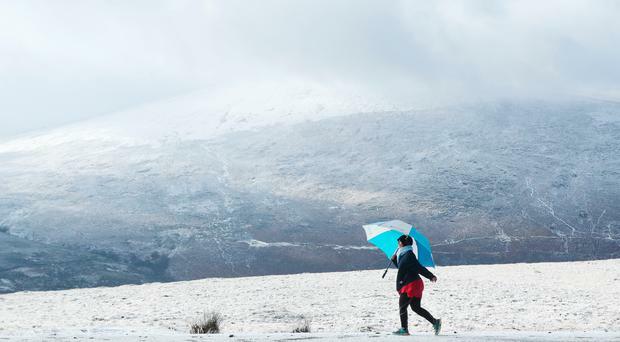 Met Éireann has warned that temperatures are to drop as low as -5C in the coming days, with snow expected to fall in parts of the country. The mercury will hit an exceptionally mild 11C before the weekend as winter's icy grip is lifted. The current cold snap is expected to worsen this week as the country is set for frost, ice, hail and snow. The current cold snap is expected to continue and worsen into next week as the country is set for freezing conditions and snow. Flurries of sleet and "wet snow" are due to sweep in as the thermometers drop below zero. The weekend is off to a cold start this morning with frost visible in many parts of the country. People can put their Christmas jumpers away as temperatures are set to hit a balmy 12C on Christmas Day. A storm has broken out between retailers and forecasters amid claims "alarmist" weather warnings are deterring people from the shops. Stormy conditions caused havoc for the second time in 48 hours across Ireland as Met Éireann warned the approach to Christmas Day will be marked by further spells of heavy rain and strong winds. We're not due a let up on the weather-front yet as forecasters are predicting the "unsettled" conditions to continue this week. The storm that battered parts of the country last night is expected to continue, with heavy rainfall and gusts of up to 100kmh. Met Eireann has issued two weather warnings as strong winds and heavy rain is expected to hit on Wednesday. The weather is set to improve today after wet and windy conditions battered the country last night. Forecasters have issued two weather alerts ahead of the next 24 hours and warned of a risk of coastal damage. Local authorities across the country have tonight been told to activate their “severe weather teams” as Storm Diana moves in. Dublin Port has reopened after being forced to close to shipping this morning as a result of widespread rain and gales hitting Ireland. The mercury is set to drop to -1C tonight as frost covers part of the country. Temperatures will remain cool for the weekend ahead - but there is a return to slightly milder weather on the horizon. Farmers have been told they should carry two months of extra silage in future to protect against extreme weather events that have become more common in recent years. A cold and wet week lies ahead for Ireland with temperatures remaining below 10C, Met Éireann have said. It's a move away from the milder weather of recent times as temperatures are set to take a dip. There is yet more rainfall expected in the coming days - but at least the cold temperatures are letting up. The current spate of bad weather is expected to continue this weekend as hail and thunderstorms are expected to hit. Forecasters have issued a number of weather warnings for the next 24 hours. IRELAND can expect more heavy snow during the winter with climate change having an effect, according to Met Eireann’s Evelyn Cusack. Wet and windy conditions continue this morning across the country after showers spread across many parts of Ireland yesterday. Spells of heavy rain will continue across the country this week following a status yellow warning at the weekend.